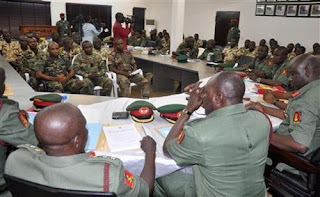 The Nigerian Army has ordered a review of the courts-martial of more than 600 soldiers and officers condemned to death for mutiny and deserting the battle against Boko Haram in the North East. AP reports that a statement released signed by army administrator, Maj. Gen. A. B. Abubakar yesterday August 2nd, states that all the accused and condemned soldiers will appear before a committee that will sit and review their cases in Kaduna state from Aug. 7 to Aug. 24. The soldiers had at different times revolted against their commanders over lack of weapons to fight Boko Haram members. Seems like former Chief of Defense Staff Alex Badeh now agrees with them.